Most of us realize that we’re not perfectly shaped, featured, or coiffed. And we probably don’t have many friends, relatives, or acquaintances who come across as model-perfect. So why do we expect the fruits and vegetables we buy at the grocery store to have a flawless appearance? This is not the typical question I ponder while driving, washing dishes or waiting in the checkout line. It came to me only after visiting an apple orchard in Yakima a few weeks ago. Farming is a precarious business, subject to the whims of the weather, which seems to be growing more capricious as floods, droughts, and hurricanes become the day’s breaking news, sometimes during seasons when we least expect them. But back to the orchard. A thunderstorm accompanied by a few minutes of hail slammed it in July, leaving pockmarks on the Honey Crisps. 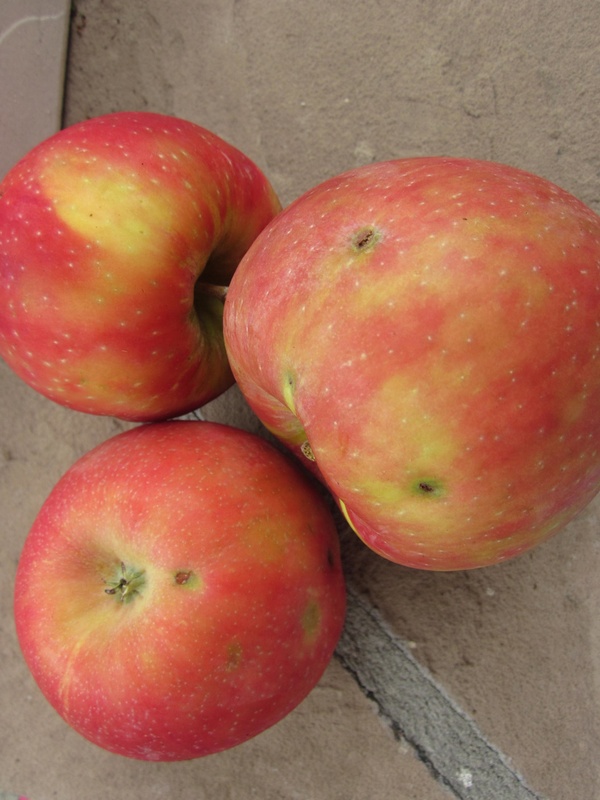 (I’m sure it hit the Red Delicious crop, too, but I’m going to stay focused on my favorites, which I was told have become so popular that they are replacing some of the older varieties I grew up with.) The surface flaws on the apples make them eligible to become slices, juices, maybe sauce, but they can’t be sold as apples. Customers won’t buy them because they aren’t pretty. This means that the farmer has to sell them to wholesalers at reduced prices. We’ve been eating some of those Honey Crisps, pockmarks and all, since we returned. They’re heavenly, perfect for eating as is, but also good for sauce and pies. I’m as bad as everyone else when it comes to choosing good-looking fruit at the grocery store, but all of us know that pretty on the outside is no guarantee of flavor within. As things are, we may be losing out on some great eating experiences and there’s no question but what the farmer’s income is subject to our whims right along with the whims of Mother Nature. Since it’s unlikely that consumers’ shopping habits will change any time soon, I’ll just leave it open for anyone who’s growing unattractive but tasty fruits or vegetables in their back yard to feel welcome to pass along any extras. We’ve already enjoyed pears and green beans from the garden of friends. That offer, however, does not apply to zucchini. This entry was posted in personal reflections, seasons and tagged fruit, Honey Crisp apples, orchard. Bookmark the permalink. I liked this one, Ann. Made me recall my youth, when my parents were thrilled to (during many Sunday drives) receive canteloupes/watermelons/tomatoes/corn/lettuce from my aunt & uncle’s small farm in the Spokane Valley. None were “perfect,” but ever-so fresh & luscious! I don’t recall that there were zucchinis…but, have found a real taste for stuffed/sauteed ones more recently.